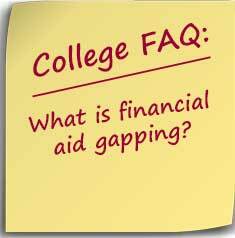 A financial aid gap occurs when a college’s financial aid award for a student doesn’t meet the student’s financial need as defined by the college. This unmet need is referred to as the gap. Gapping became a verb as some colleges have earned a reputation for failing to meet student need, especially students admitted with qualifications placing them in the middle to bottom of the class. Students in the bottom quarter of a class in terms of qualification are always at risk of being gapped with the exception of the most competitive institutions that meet 100% of need. The financial aid gap is a serious concern because the student and family will be responsible for the unmet need in addition to the Expected Family Contribution (EFC). Usually, students with gaps will be unable to use federal loans to help cover the gap or the EFC because the college has assigned it to cover part of the defined financial need. Often, students may not realize that they have been gapped because the financial aid award letter will have the amount covered by a PLUS loan. However, a PLUS loan is money borrowed by the parents and should not be considered part of the college’s financial aid award.